Due to increased customer demand, Vulcan completed a Mill Expansion in early 2014! 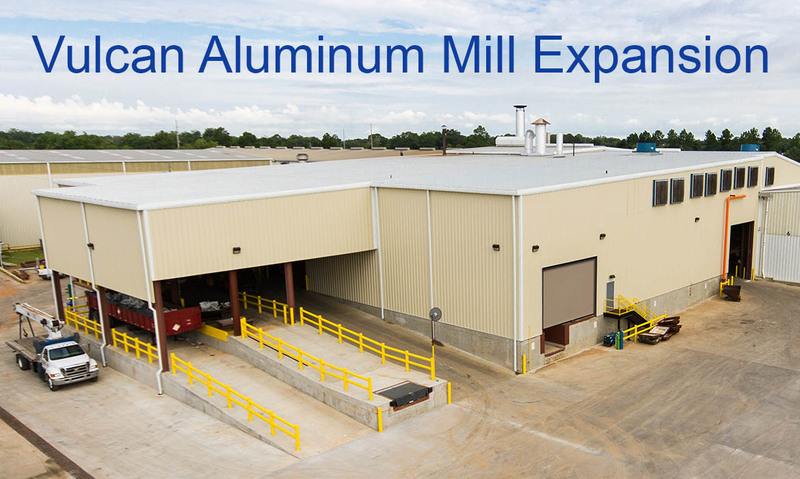 Vulcan Aluminum Mill recently completed an 18.5 million dollar mill expansion in order to increase capacity and meet customer demand. The project included the addition of a state-of-the-art, 24,000 sq. ft. building to our existing facility as well as installing a new Annealing Furnace, Water Cooling System and Melting Furnace. Modifications to the Mill and mill-associated equipment were also performed to enhance speed and efficiency. In addition, a Data Acquisition and Ethernet System was installed. This expansion will allow Vulcan to broaden its product offerings to include additional aluminum alloys required to serve new markets, primarily automotive. Our Cooling Towers provide tempered water for Vulcan Aluminum Mill's Caster. Once the water from this closed loop system has been used in the casting process, it travels back to the Cooling Tower to be reused in the same capacity. With a maximum capacity of 102,000 gallons, this system is in operation 24/7. A second Aluminum Melting Furnace was a major component of our recent mill expansion. The new furnace has the capacity to melt and hold 220,000 pounds of molten aluminum. The molten aluminum is then transferred to our original furnace, which acts as a holder. Melting Furnace #1 also has the ability to transfer molten aluminum directly to the caster. Our Zmag "MagStir" molten metal stirrer is a large permanent magnet circuit based system used to stir aluminum within the melting furnace. This piece of equipment is an integral component to the melting process due to its ability to increase the melt rate and makes for an even bath temperature inside the melting furnace. Zmag's MagStir Series II is the first of its kind installed in an aluminum mill in the United States. The addition of a second Annealing Oven was necessary to facilitate growing customer demand for tempered 5052 and 5754 aluminum alloys. The Annealing Oven's primary function is to lock in the mechanical properties of the aluminum coils.